Cities in Ruin brings four new investigators, and a slew of new monster and encounter cards to the world of Eldritch Horror. New Ancient One Shudde Mells presence brings a destructive twist to the game in the form of deadly disasters. 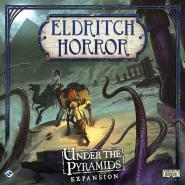 Ancient secrets, sandblasted ruins, and unprecedented horrors await in Under the Pyramids!This side board expansion opens up six new locations throught Egypt, including bustling Cairo, ancient Tel El-Amarna, and the shining, snaking, Nile River. 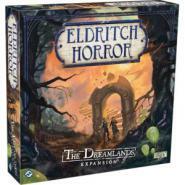 Descend into a world of sleep and splendor with The Dreamlands, the latest expansion for Eldritch Horror. For the first time, you have the chance to walk upon the sweet-smelling grass of the Enchanted Wood, travel into the Underworld, or sail off the edge of the world and voyage to the moon-this expansion introduces an entirely new side board, portraying the mystical, ethereal Dreamlands. 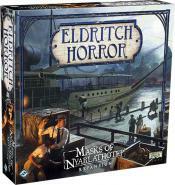 Eldritch Horror: Masks of Nyarlathotep is an expansion for Eldritch Horror, a cooperative board game for one to eight players in which intrepid investigators must traverse the globe in an attempt to thwart the cataclysmic rise of an otherworldly Ancient One. Strange cults are gathering strength in remote corners and bustling cities all over the world. Though they seem to worship different gods, the investigators have found a thread that runs throughout all of the cultistsâ€™ horrific rites. In Masks of Nyarlathotep, each of these sects pursues the awakening of an aspect of the same horrific creature: Nyarlathotep. This being is known as the Messenger of the Outer Gods, and he is the only Ancient One that still actively walks among humanity.